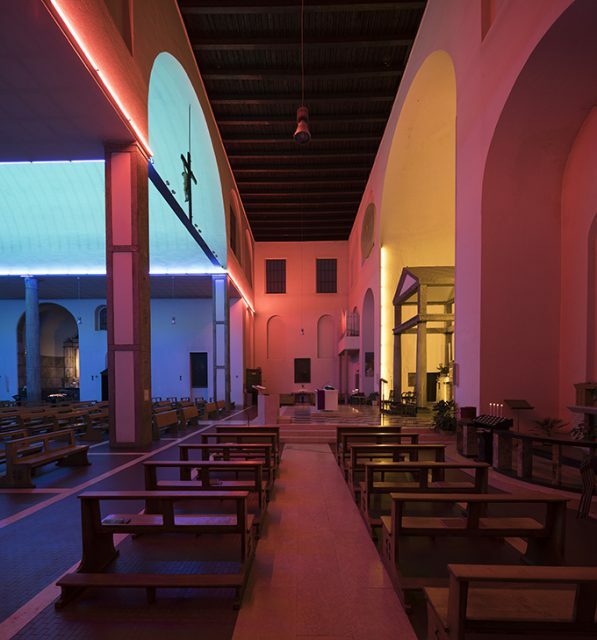 In 1996, following an invitation from Italian priest Giulio Greco, American artist Dan Flavin (New York, 1933-1996) created an artwork as the central element for the restoration and renewal of the Santa Maria Annunciata in Chiesa Rossa church in Milan, which was designed by Giovanni Muzio in the 1930s. 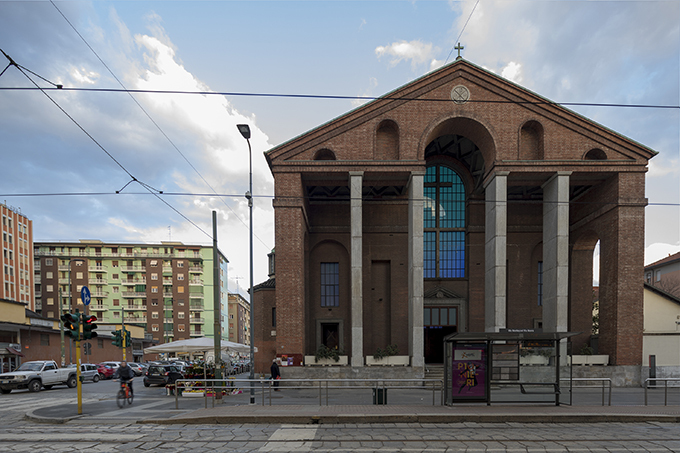 One year later – as part of the first Italian exhibition dedicated to the artist – Fondazione Prada realized this project in collaboration with the Dia Center for the Arts in New York City and the Dan Flavin Estate. 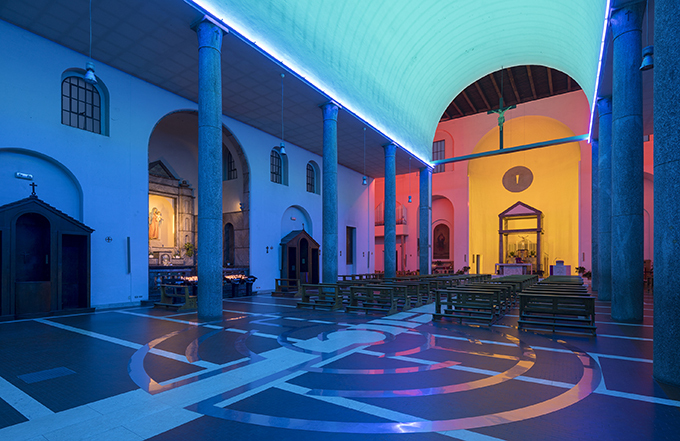 Inside the church, the site-specific artwork Untitled, with green, blue, pink, golden and ultraviolet light, constitutes the sole source of illumination and permeates the entire space, accompanying visitors. Walking through the entryway, the chromatic succession of the nave, transept and the apse suggests the natural ‘night-dawn-day’ progression of light. 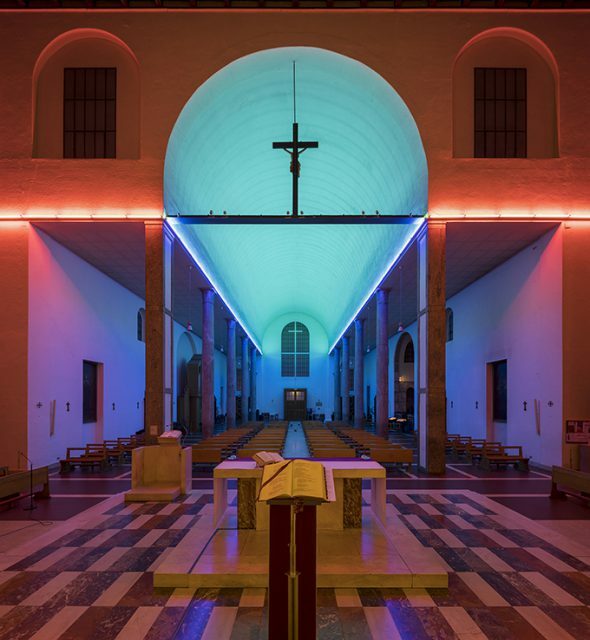 Starting in the 1960s, Dan Flavin undertook a systematic investigation of art in relation to real light sources: the basic modules of his work are industrially produced fluorescent neon tubes, articulated in simple, symmetrical combinations. In direct reference to the spirit of ready-mades, the neons are used as basic building blocks that can be articulated into potentially infinite compositions. The essential approach, limited vocabulary of forms and colors utilized and the almost scientific ingeniousness of the discovery of an art of light have made this artist a progenitor and primary exponent of Minimalism. The artist was intimately familiar with theology and art history, and provided new perspectives on both traditions. 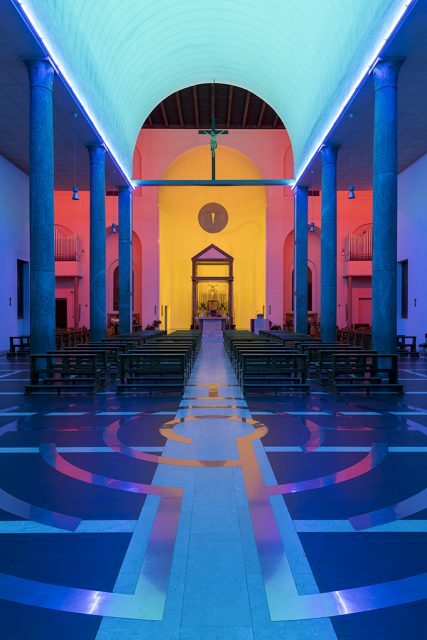 Although he never permitted any symbolic or spiritual interpretation of his work, it doesn’t seem accidental that Flavin’s career began with “icons” – monochromatic painted squares with lights and light bulbs attached – and ended with a project to illuminate the interior of a house of worship.